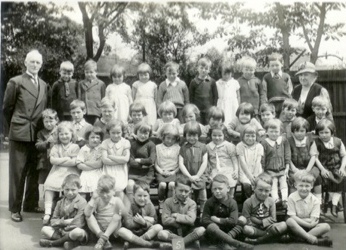 From 1938/9, this is the same photo as that sent by Jeanne Whitby, however it shows an extra two children taking the class size to 44! 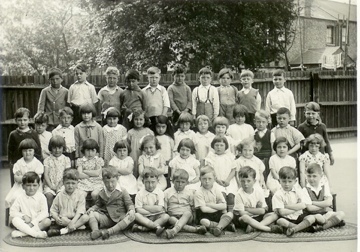 Helen adds: The following are more class photos from St George's, presumably with the same children, as I think my dad is in each. 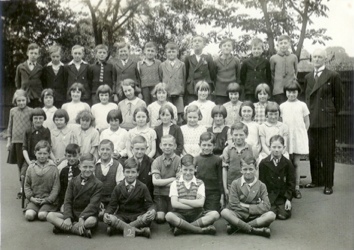 It is interesting to see the school master in this one - I would love to know who the lady is! Please get in touch if you can help. In the third photo the children look younger - but the mats are the same! 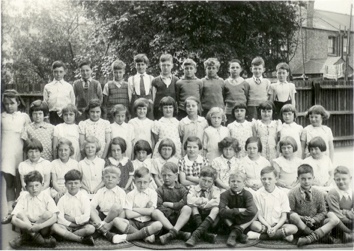 Fourth photo: no mats here, and the children look ready to move up to senior school. I know that dad did not have the opportunity to take the eleven plus but went straight to secondary modern. He was really clever, but had had an education interrupted by war and constant visits to the shelter, and was very aware of his poor spelling. Dad, Arthur and their older sister Nellie were evacuated, but only for a couple of weeks - their mum Annie missed them so much that she went and brought them home again. If you can add any names to the photos please get in touch.